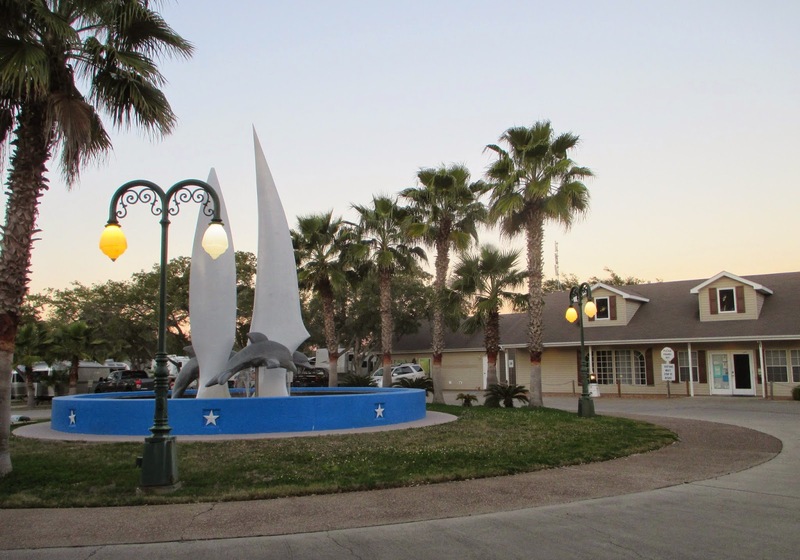 Doc said it was okay to drive Phannie, and my busted foot doesn't have much pain now, so it didn't take us long to break camp in Rockport and get to an even more pleasant winter location here in Mercedes, not far from Padre Island. Llano Grande has become a favorite upscale south Texas resort, our having discovered it through friends Ed and Marilyn, who made it their winter hangout for several years. A couple of maintenance issues appeared toward the end of our stay at Rockport. I am hesitant to mention that we had to replace our potty (potty seems a more innocuous term than toilet or commode), but this is one of the more essential and popular fixtures in any RV, and they don't last forever. When we bought Phannie, we had the original potty replaced with an upgraded porcelain, high-rise model, and it had served us well for four years. Of late, however, we felt the "end was near." (Please pardon that awful pun; I just couldn't help it.) It was having problems holding water, and we stopped an RV technician's van there in the Lagoons RV Resort to get him to check it out. He said the repairs would be half the cost of a replacement, so we elected to order a new one, which he installed in a couple of days. I would include a photo of the new potty, but somehow that strikes me as being even more peculiar than writing this post about a potty, which seems pretty doggone peculiar itself. The other maintenance problem involved the refrigerator icemaker's water supply. The supply line fits onto the fill valve using a hose-type coupling with a neoprene washer. While we were out, this coupling began to leak and soaked the carpet in the dining area. Installing a new washer was an easy fix, but it has taken three days with a fan blowing on the carpet to dry it out. These repairs came on top of other earlier ones that involved replacing a windshield wiper arm assembly and blade (Tiffin had it in stock in Red Bay and got it to me in a couple of days) and a faucet at the bedroom sink. Both chores were expertly done by S.I.L. Tyler, when we were still in Houston. Thanks again, Ty! 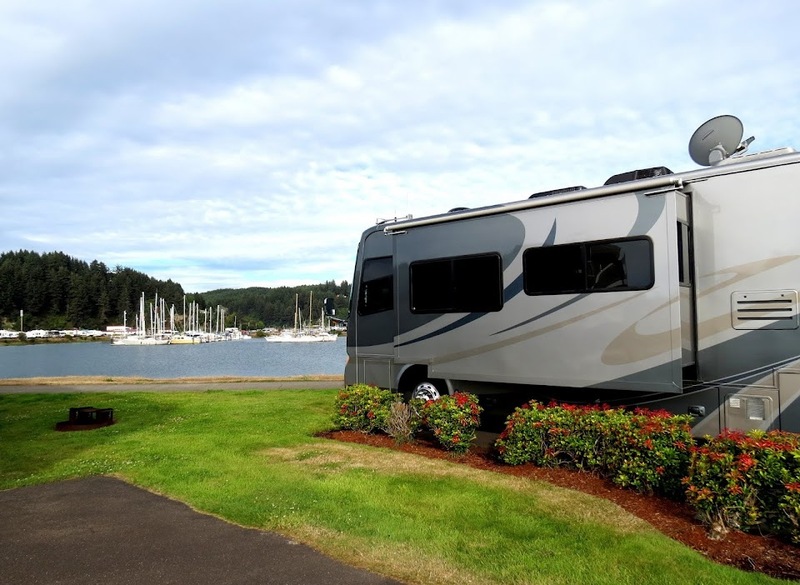 I include the mention of these occurrences especially for readers who may be considering purchasing an RV. They illustrate typical problems that will be encountered when you are operating a complicated vehicle that is also a house. Things are going to break or wear out rather frequently, and you will have to deal with getting them fixed. It helps to be handy at this sort of thing, but it's not necessary. I am only minimally mechanically minded, but I am actually able to deal, however clumsily, with most of the minor discrepancies that come along. The major ones can always be fixed by professionals, but you usually need to have a well stocked wallet when you use them. This brings up a question about extended warranties. I bought one with Phannie, but I wouldn't do it again. Since that warranty is about to expire, having had almost no claims on it, I'm not going to renew it. I have instead funded a maintenance account that I will add to at about $300 per month. Besides using it for repairs, I will also pay for routine service out of that fund. I know several RVers who have done this, and they agree it's a better deal for them than the extended warranty. They have even had their funds build up enough to buy extras for their rigs that they wouldn't otherwise have been able to justify. There's always the risk, of course, that something very expensive could go haywire before the fund is fully built up, but it only means we would have to tap other reserves that we wouldn't normally need to access. Since I tend to treat Phannie like a baby and carefully follow the manufacturers' service schedule, I think the odds are pretty good that the near-perfect reliability of the engine, drive train and chassis will continue. I do think that a roadside service contract is a good value, however, so I rely on Coach Net for that. We enjoyed our stay in the Corpus Christi area, especially since we missed the snow and ice that snarled everything near our Fort Worth area home. And yes, it's hard not to be smug as we enjoy the warm sunny days here in the Rio Grande Valley. 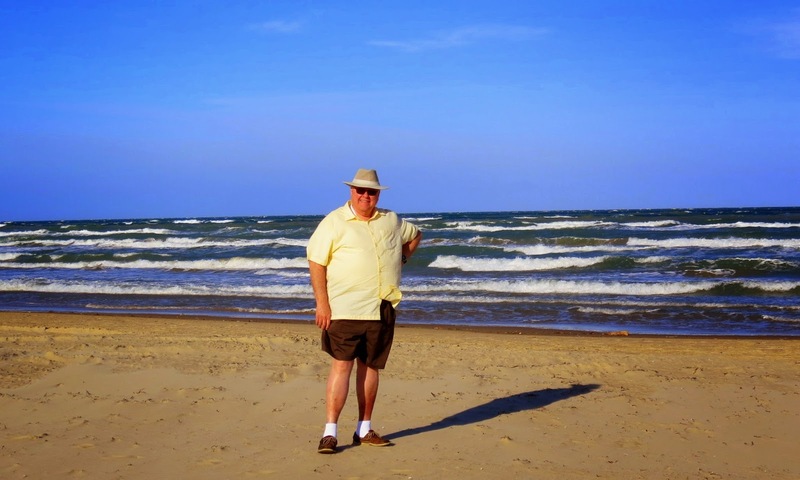 On the beach at South Padre Island. No snow here! Thank you, Lord, for the wonderful life You've given me. Please forgive me if I do not appreciate it enough each day. I suppose it's time to catch up on restaurant reviews. Yes, I do a lot of these in this blog, and there have been a number of commenters who wonder if all we do is eat out. Well, while we do other things, we also tend to eat regularly and, admittedly, most often at restaurants. We usually eat a light breakfast in Phannie, but at lunchtime and dinnertime, we are often sightseeing or otherwise roaming around, so we usually grab something to eat at a restaurant that has been recommended by others or that has good reviews on Yelp, Urbanspoon, Local Eats, Trip Advisor or TV Food Maps. Sometimes we just stop somewhere and take our chances. We tend to avoid expensive venues and chain restaurants in favor of places where the locals go for a good meal. Ferreting those out is sometimes an adventure in itself, because it may take us off the beaten path to a discovery that would be missed by the tourists. Another benefit is that we have a permanent record of the places we like (and don't like) in case we find ourselves in the area again. We really see no need to apologize for this, as cooking meals for just the two of us is time consuming and messy. We try to mitigate some of the expense of eating out by choosing more modest restaurants, sharing an entrée, skipping adult beverages and, of course, taking advantage of senior discounts. By doing this, we don't think it's too much more expensive. Did I mention there is nothing to clean up? There's also the potential for people watching. 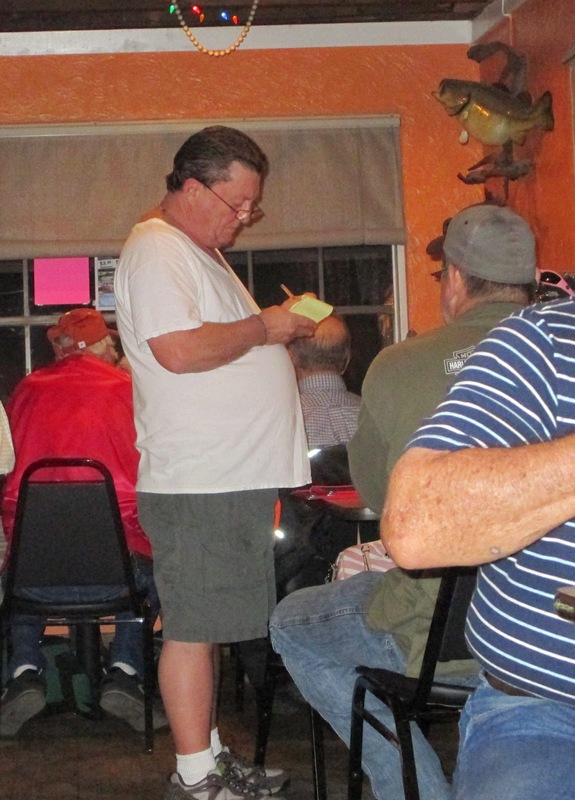 Many of my inspirations for posts come from observations of restaurant patrons or workers. It's a slice of life that shouldn't be ignored, and I exploit it when I can. There's also the matter of my bum foot; I am somewhat circumscribed in my activities at the moment, so going out to eat is a welcome diversion from the confines of Phannie. Fortunately, we have previously toured most of the tourist attractions in this area and posted about them on the blog, so my temporary lack of mobility is not causing us to miss any sightseeing. 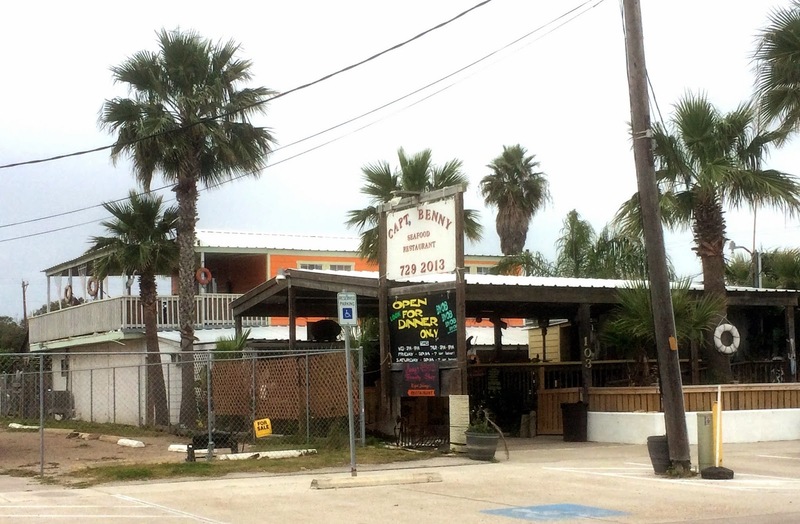 Following are comments about some more of the restaurants we've sampled here in Rockport. You will notice that most are seafood restaurants, of which there are many in this area. We are very fond of fresh seafood and, since it doesn't get much fresher than that which comes in on the boats each day, we indulge ourselves. The Bleu Crab Cafe. A new restaurant that is trying too hard to be something it isn't. It has a promising chef who is--I never thought I would say this--too heavy handed in using butter. (Yes, Paula Deen, there is such a thing as too much butter.) Its offerings are too expensive and esoteric for an inelegant café in a strip shopping center. They'll need a lot of luck, I'm afraid. Three and a half stars for food, but two and a half overall because of the identity crisis. Jalisco's. A somewhat tired but inexplicably popular Mexican restaurant where the food is just serviceable at best. The enchilada sauce is likely out of a can. Although there were few patrons in the restaurant when we visited, there was no place to sit, as every empty table needed bussing. Only 2 stars for this one; don't bother. The Shack Smokehouse. A typical BBQ joint that is definitely a hangout for the locals. The service is good, and the staff is friendly. We liked the barbeque, but while the ribs had a good smoky flavor, they were way overcooked. The meat on a perfectly cooked rib should adhere to the bone just slightly as you take a bite. These ribs fell apart when I lifted them from the plate. Sandy tried a hamburger, which was quite good. The meat patty was hand formed and generous, the bun was toasted and, thankfully, the burger was served fully assembled. (If there is a pet peeve of mine, it is a hamburger that is served dismantled. This irks me because the purpose of coming to a restaurant is to have a meal prepared for me. If they leave some of the job for me to do, I may as well have stayed home. Such an error would be fatal in my book, and I would not darken their door again.) Three and a half stars, though, for the Shack; it's worth a visit. Sandy's burger at The Shack. Now that's what I'm talkin' about! 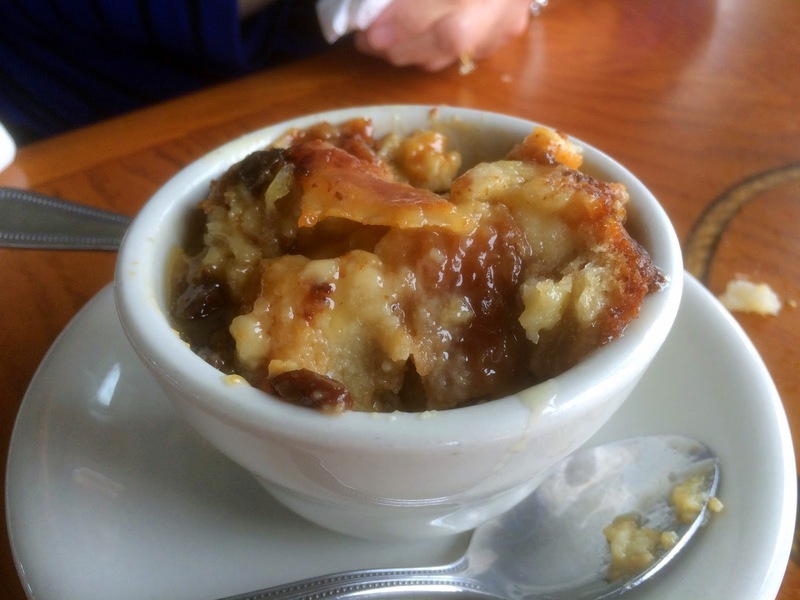 One thing you really shouldn't miss at Charlotte Plummer's is the bread pudding. It has a wonderfully rich bourbon sauce and is probably too sinful to be eaten on Sunday. But we did; we'll repent later. Bread pudding at Charlotte Plummer's. JD's Seafood and Burgers. We had a fried seafood combo of fish and shrimp which was pretty good. It was on a lunch special for $13.95, which we thought was a good deal. The regular price of $19.95 would have been a bit much unless the portions were larger. The staff was friendly enough, but our server was distracted. On the day we stopped, they could accept only cash, claiming their credit card machine was on the fritz. The décor was sparse and uninspired, and we got a feeling that all may not be well from a business standpoint. Two stars for this one; we don't think we would go back. Captain Benny's Seafood. If there were ever a hangout for locals, this is it. We were greeted by Captain Benny himself, a wiry old gentleman who constantly mumbled to himself and assiduously guarded the cash register. Everyone seemed to know him except us. The patrons also seemed to know each other, and several groups sat at large mismatched tables in the ramshackle place. They were surrounded by many beer and wine bottles they had carried in themselves, as the restaurant is BYOB. Most of the bottles in view were empty or nearly so, and the noise levels at the tables seemed to increase proportionately with the consumption of booze, which is, of course, not exactly a new phenomenon. The service was incredibly slow--it took about an hour to get our meal--but it was no faster for the regular patrons either, who were really too sloshed to care. One woman feeling no pain at a nearby table took the opportunity, in an increasingly loud voice, to describe in excruciating detail the labor and delivery of her two children. Very little was left to the imagination, including a description of how the doctor "cleaned her out" once the baby had arrived. Fortunately, our meal had not yet been served, so we had a little time to recover after she had finished the grisly story. The food? Quite good, actually. The shrimp and fish were very fresh and tasty, and the price was fairly reasonable. Three and a half stars; we would go again, even though the service was slow. It's sort of like driving up on a traffic accident; you know it's not going to be pretty, but you can't keep from looking. Captain Benny's. Pretty much a dump, but the locals love it. 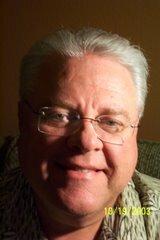 Non-RVer: "Let me get this straight; you drive a 16-ton bus all over the country for weeks or months at a time, pulling a car behind you and staying overnight in trailer parks?" 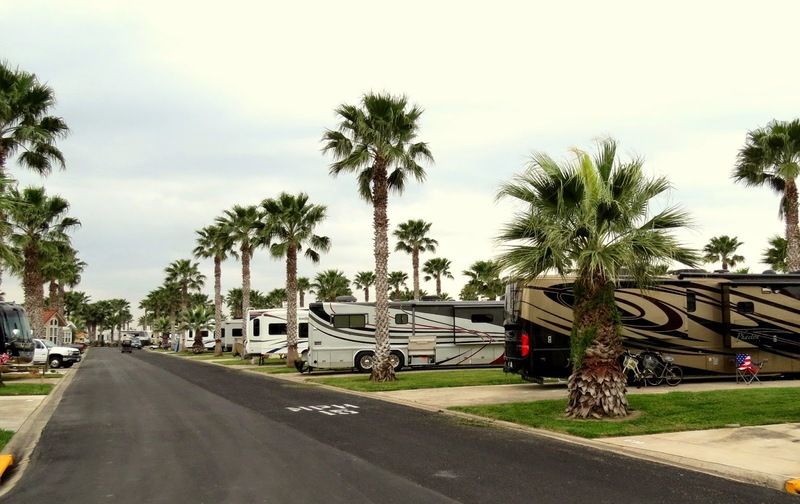 Me: "Well, we call them RV parks, but some folks don't even use them all the time. They just park on public lands and camp off the grid." Non-RVer, eyes widening: "What do they do with their houses?" Me: "Some RVers known as fulltimers don't have a regular house. They elected to sell it and live fulltime in their RVs." Non-RVer, after audible gasp: "But you still have your house." Me: "Yes, but we're not sure why; we're rarely there." At this point, he or she probably has raised at least one hand, palm to the side of the face and mouth agape. 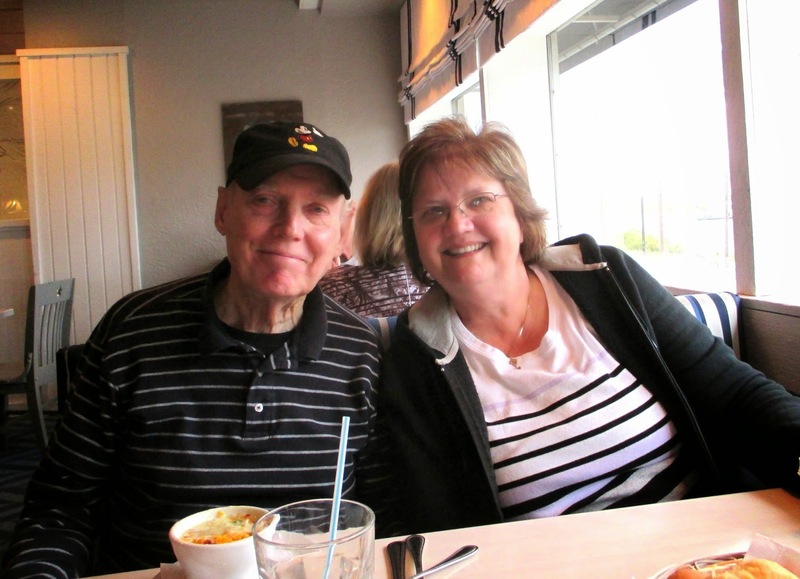 Before dinner, we sat quietly on a bench near a wooden pier overlooking Aransas Bay. A dozen or so seagulls wandered nearby on the beach, some flying away and others swooping in to take their places, their screeches unintelligible to all but their preening brethren. There was a light breeze, so the bay was not quite as placid as usual. The fronds of the palm trees, acting as windsocks, pointed ever so slightly to the southeast, revealing the wind's direction as from the northwest. The latest cool front had all but exhausted itself, having been denuded of its clouds and ushering in the bright sunlight and impossibly blue sky that we sometimes take for granted in Texas. Although we were in our shirtsleeves, a light jacket would feel good at nightfall. It was a beautiful and peaceful place, and the world's ugliness and strife seemed very far away. We can't help but marvel at our having been blessed to arrive at a point in our lives where we can follow the sun and not have to be entombed in the massive snowfalls of the frozen north that we've seen on TV. Or, if we're not trying to escape the heat or cold, we can merely change the scenery whenever we wish. Some don't understand it at all, and that's fine. I know so many people who cannot imagine themselves in such a vagabond-like lifestyle, just as I cannot fathom the boredom I would be forced to endure while imprisoned in a house, awaiting the end of my mobility that old age will bring. The window for going, seeing and doing is open for now, and no one but the good Lord knows when it will close. But close it will, and I do not wish to regret the adventure not taken. 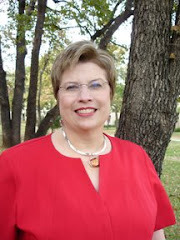 Sandy's most significant automobile accident occurred when she collided with a vehicle driven by her own husband. She once collided with an appliance in our garage. In an attempt to back our Suburban out of the garage, she managed to get it caught sideways in the structure and had to call me home from work to straighten it out. I asked if it could wait until after work hours, but she informed me that her beauty shop appointment constituted an emergency. I came home. B and J Pizza in Corpus Christi. Oh, my! This cavernous place has some righteous pizza. It was packed when we went on a Friday night, and it took nearly an hour to get our pizza, but it was worth the wait. Super fresh toppings lay on a crispy crust that was also light and tender. 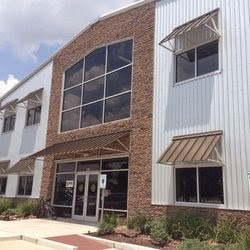 It reminded me of the 5 Ate Café, a favorite in Houston featured in an earlier post. Four and a half stars for B and J; it would have been five had the wait not been so long. I'm in line to order at B&J Pizza. 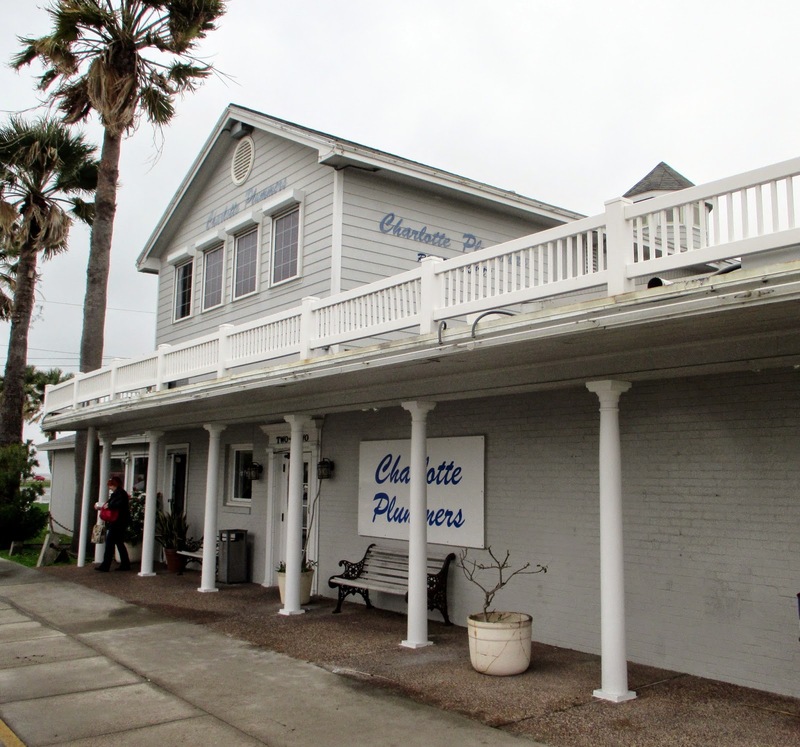 For our Valentine's Day dinner, I chose Roosevelt's at the Tarpon Inn in Port Aransas. This was a really fine place, and we enjoyed immensely some expertly-prepared mahi-mahi and flounder and the attentive service. Very fresh, very tasty and very expensive, but nothing is too good for my Valentine, right?! Four and a half stars for Roosevelt's; I would have given it five, except I didn't care for the julienned vegetable saute served as a side. (Had the veggies not been cut so fine, they may not have suffered from being slightly overcooked.) 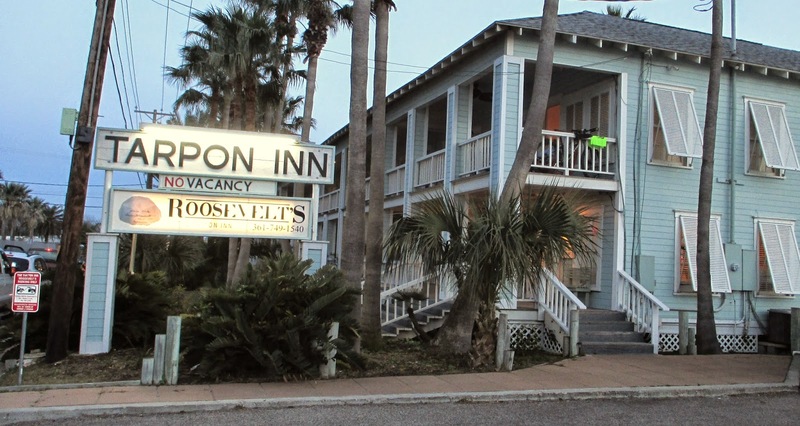 The original Tarpon Inn was built on this location in 1886; the restaurant was named in honor of onetime guest Franklin D. Roosevelt. The Tarpon Inn looks rundown, but it's not. This is typical of small coastal towns. Garlic bread served at Roosevelt's. Just as good as it looks! I suppose one can tell the quality of his friends by the quantity, if not the quality, of their harassment. Well, I must have some doozies. While most of the comments were kind and sympathetic regarding my poor broken foot, some of the wags whom I reluctantly identify as friends had a different kind of support in mind, namely, none. Ed assumed I tripped because I was blinded by the noon sun when I awoke. Bob figured I had been thrown out of a restaurant, since I seem to spend so much time in them. John said he would "run the numbers" to see what he would charge me to drive Phannie home. Well, I don't want to throw stones, but the only reason Ed gets up before dawn is that he thinks he has a dog to let out. (He doesn't.) And Bob is understandably confused, as he's probably nearing 80 (he just had another birthday party where everyone put on sunscreen when they lit the candles on his cake). And John is so cheap that he once went outside and fired a gun on Christmas eve so he could tell his kids Santa killed himself rather than tell them they didn't get any gifts. But never fear, dear reader; just because I get jokes about my seemingly incessant posts about restaurants, I will continue undaunted to share my foodie impressions so you can weed out all but the best if you ever find yourself near where we've been. 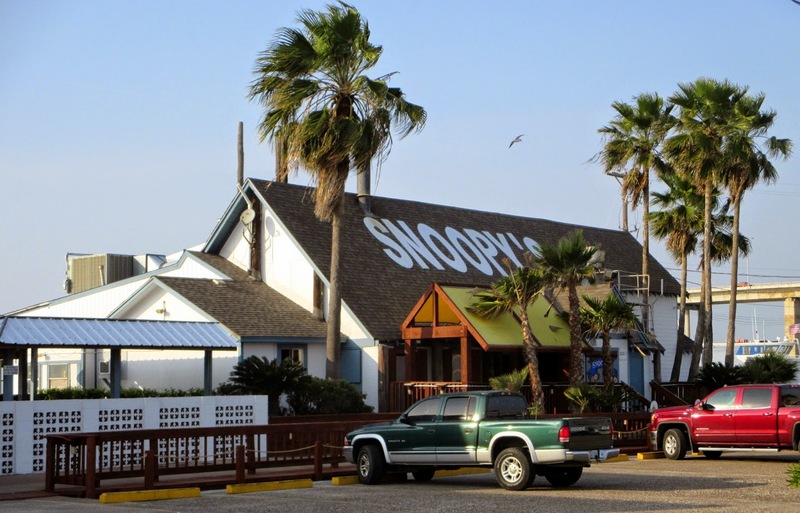 Today we went to Corpus for the day and stopped at Snoopy's Pier, a hulking restaurant overlooking Corpus Christi Bay and offering dining that is mostly al fresco. You order your food at a counter and take a seat, then a server will bring it to your table. The seafood was quite good and fresh, and I really enjoyed the fish and chips. Perhaps the savings in staff helps keep the prices fairly reasonable, and that's always a good thing. I give this one 3.5 stars, meaning it's worth the trip. 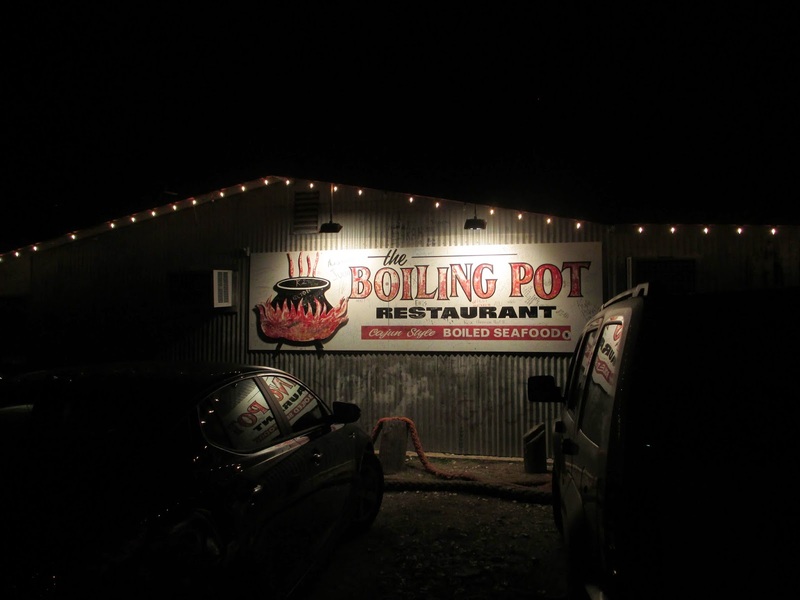 Not having had quite enough fresh seafood at the end of the day, we stopped at the Boiling Pot in Rockport. 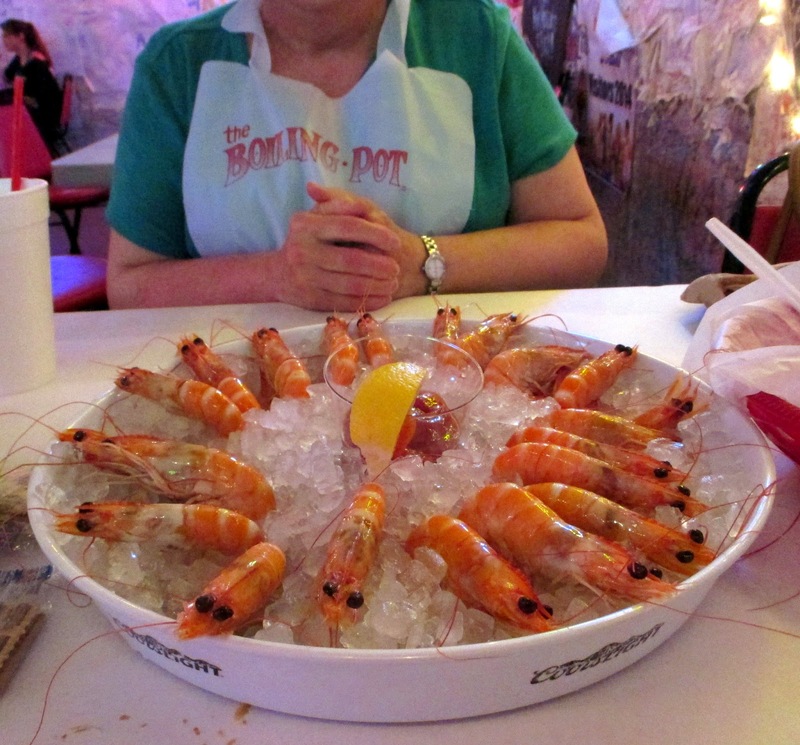 This ramshackle place serves mostly fresh boiled seafood, Cajun style, where they dump the steaming, spicy contents of a boiling pot onto your table. Then they put a bib on you, and you go after it, eating with your hands. Besides the shrimp, crab or crawfish, you also get a bonus of sausage, potatoes and corn, so bring help to eat it all. We were not really all that hungry, so we settled for a bowl of gumbo and a plate of boiled shrimp. The gumbo was outstanding and very spicy, just the way I like it. The shrimp were good, too, but since they had their heads on, Sandy was freaked out a bit by the beady little eyes staring up at her. She also proclaimed that one of them was cross-eyed, but I couldn't confirm it, mainly because I'm sane. I give this place 3.5 stars, so it's worth patronizing. One more thing: Its a little pricey, so bring your man-purse along. Lord, thank you for the wonderful life You've given me. Please forgive me if I fail to appreciate it enough each day. I have always had a problem in not watching where I'm walking; I tend to gawk at most everything else instead. I suppose I'm afraid I'll miss something going on around me, or I could just be people-watching. Anyway, paying close attention to where my feet are seems entirely too boring. However, a rudimentary awareness of the ground upon which I'm walking is much more likely to help me avoid certain hazards. It was that lack of awareness that caused me to step in a hole while walking a couple of days ago. The hole was mostly obscured by grass, but I'm sure I would have seen it if I had been looking. I felt the jolt immediately and began to stumble, but I caught myself before my careening developed into a full belly-flop, which would be so like me. After recovering my balance, I didn't notice the pain at first, but as the time went on, my right foot began to swell, and walking became painful. Finally, a trip to an urgent care facility here in Rockport for x-rays confirmed that I had a fracture at the base of the fifth metatarsal. 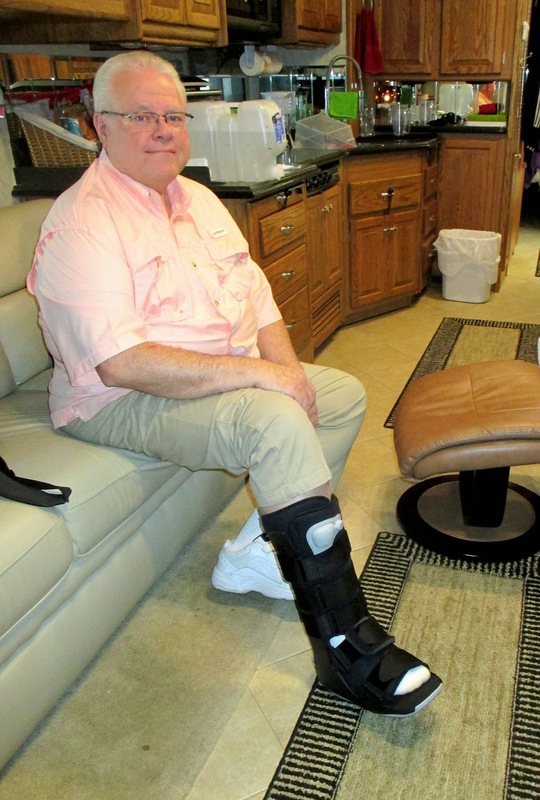 It's really not a big deal, as it will only require a special boot to be worn to stabilize the foot as it heals. A larger issue is the loss of dignity as I hobble around, zombie-like, everywhere I go. This will cause us to extend our stay here for a while, until such time as I can safely drive Phannie again. There are worse places to be, however; the blizzard-ridden northeast comes to mind. Having added some local support for Mindy's entry to nursing school, we decided to get out of her family's hair and continue with a little winter vacation of our own. But first, we made a quick trip in Mae back home to collect a month's worth of mail and take care of a few chores around the house. (For those who gave up the demands of your stick house in favor of fulltiming, you can gloat here.) 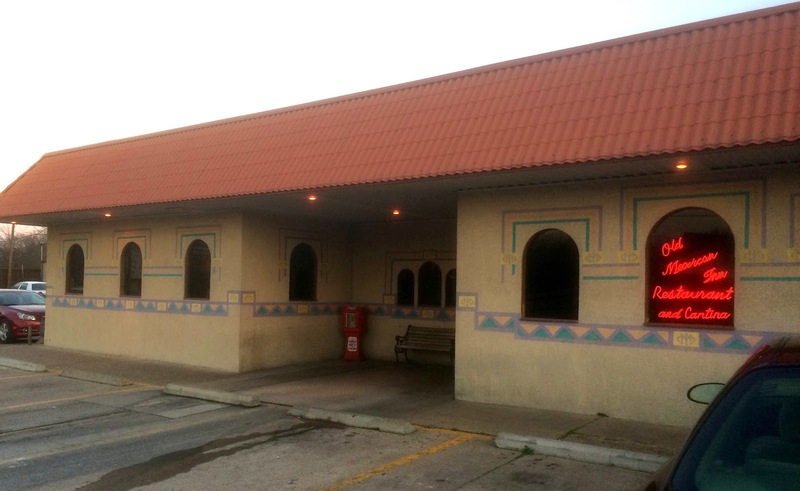 On our way back to Phannie, whom we left forlornly at Rayford Crossing, Mae decided it was time for us to visit the Old Mexican Inn, a favorite restaurant in Corsicana. So she suddenly veered off I-45 and drove through downtown and out highway 31 to this wonderful old Mexican food emporium operated by the Flores family since 1941. We're glad she made the sudden diversion, as Sandy and I enjoyed a collection of favorite dishes, including tacos al carbon, enchiladas and queso, and they were, as always, delicious. I absolutely recommend this place as probably the best stop you can make if you're hungry between Dallas and Houston. A couple of days later, we departed Rayford Crossing and began the 217-mile leg to Rockport. This required me to make a choice between using the tollway around Houston and going straight through downtown, where it is necessary to transition to U. S. 59 toward Victoria. I really don't like going through downtown, because the traffic is usually heavy, and being in the correct lane at the right time is crucial. This is not all that easy in a motorhome pulling a toad, and it is made worse by Houston's legendary hateful drivers. To give you an idea of how boorish they can be, I was minding my own business earlier in the leg when I turned Phannie onto the I-45 service road. Two drivers in the next lane honked and gave me the middle finger for no apparent reason. I gave them a long blast with Phannie's air horn, which obviously startled them and caused one of the drivers to jerk his steering wheel, almost hitting the car alongside him. Pity he didn't. Since it was midday and a less busy traffic time, I decided to go through downtown, the argument for that choice being the shorter driving time--it's a long way around the loop--and the money to be saved in tolls. It would have cost more than $25 to get Phannie around the beltway to U. S. 59. Even with the time of day being ideal, the trip through downtown was still harrowing. There was one place where we wouldn't have been able to move into the correct lane except for a courteous driver who made room. Thankfully, it was not one of the guys who earlier showed me the naughty digit. Phannie purred smoothly all the way to Rockport, and we pulled into The Lagoons RV Resort just before they closed the office at 5:00 PM. Lagoons is a very nice and friendly park, well-maintained but restricted to 55+ travelers. We sorta lucked out getting a space there, as they had only one left. Reservations anywhere in the Rockport area are not easy to find in winter. Seeing the palm trees below and noticing guests dressed in shorts and flip flops tells you all you need to know about the attraction this part of Texas has for snowbirds. 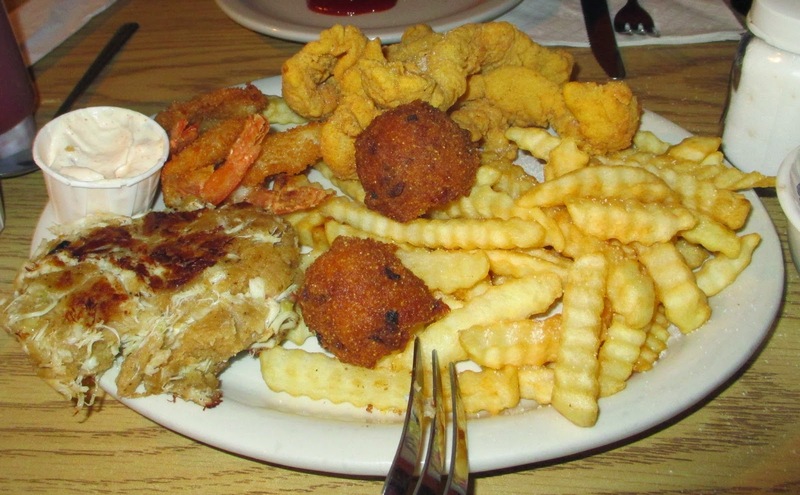 We asked the desk clerk about favorite restaurants in the area, and she quickly mentioned Shempy's, a little seafood place that we decided to investigate. The little place was packed with customers, but we soon got a table and placed our order for a seafood platter that Sandy and I would share. Below is a photo of the gigantic platter. By the way, the crab cake was huge, with more crabmeat than I had ever seen before in one of these. Shempy's is obviously not a place where you need to worry being underdressed. Although I didn't confirm, I assume the guy in the t-shirt below is Shempy, as he seemed in charge and was speaking loudly to everyone. When he came to our table, however, it became obvious that his elevated speaking volume was used because he was hard of hearing. By the time I screamed my order to him and he screamed it back to confirm, everyone in the restaurant knew what we were having. 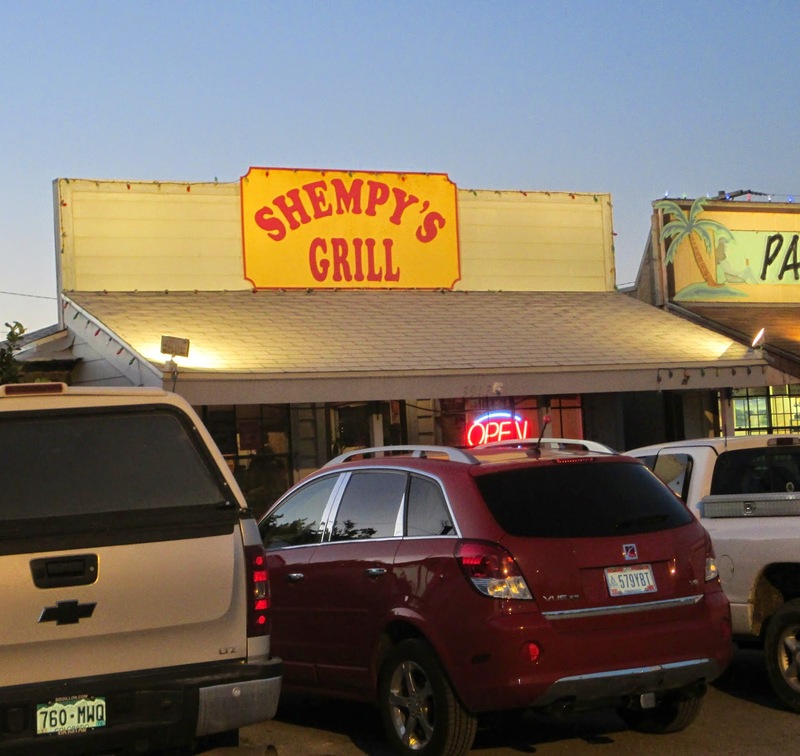 So, if you decide to go to Shempy's, be prepared for good food and friendly people. But for goodness' sake, don't go overdressed! We are not morning people. Frankly, I fail to understand why some retirees insist on rising before the sun does. There's no reason for it that makes sense. Humans don't have very good night vision, and they tend to bump into things when it's dark. I know I do! Sandy and I try to get up by 8:00 AM unless, well, we don't want to. Our sleep needs differ. Sandy is an eight-hour sleeper; I rarely sleep more than five. I often offer her my hypothesis that bright people need less sleep than, well, the unbright, but then she offers her own hypothesis that a frying pan could make a good hat for me. We are very picky about our bed. Sandy and I really struggle to sleep well if we find ourselves on a strange mattress. For this reason, we duplicated in Phannie our pillows and the favorite iComfort kingsize mattress we use in our house; that way, we can't tell any difference. In fact, we sometimes awaken and do not immediately know whether we are at home or in Phannie. That's not a bad thing. Thank you, Lord, for the wonderful life you have given me. Please forgive me if I do not appreciate it enough every day. I haven't been including too much about our restaurant adventures lately, as we really haven't been all that impressed with some of the places we've been. Until now, that is. I've already mentioned El Palenque here in Spring as a wonderful Mexican restaurant, but I must remove my hat now in reverence toward our new find today. The 5 Ate Café (again, here in Spring, Texas), has possibly the best pizza on the planet, yet it is possibly the restaurant least likely to be identified as such on the planet. It is located, of all places, in the Inspire rock climbing gym at 403 East Louetta. Would you think you would find the world's best pizza in this place? Neither would I. Don't be scared away by the young athletic types in view who scurry up and down the vertical walls of the gym as if they were large spiders. Is that something I would try? Absolutely not; the injuries that could result are limited only by the number of bones in my body. We shared the Italian Pizza, a perfect marriage of a thin, almost flaky crust, along with the freshest of Italian meats and cheese. The crust was a thing of beauty, oddly contradictory in that it was thin and crispy and, at the same time, tender. The sauce was inspired, being oh, so flavorful, without being too thick and pungent. The meat toppings, clearly sourced from Italy, had little need for a huge layer of accompanying vegetables, so a few slivers of onion and basil served more as a filigree than anything else. We also tried one of their signature burgers and thought it very tasty but, frankly, we couldn't get past the pizza. Oh my! You must try this place. Sorry for the quality of this photo; the pizza was so good, I forgot to take my own. This is from their website. Okay, next subject: It's time to reveal more oddities--this time about me. I don't like football. GASP! Yes, you heard that right. Now that I've admitted it, I won't be surprised if I hear a knock at my door and then be led away for psychological reprogramming. With football fanaticism the way it is in Texas, it is just not thought normal that a native Texan could renounce it. It's a little like being an atheist here in the Bible belt. It's not that I haven't tried. I've attended many games, but found that I was bored to tears watching a group of grown men, sweaty and musclebound, chasing that odd-shaped ball around the field. I just don't see the point. Sure, they might win the game, but so what? The win is only good for that game, and the number of games yet to be played is limitless. A point will be reached where they will lose a game, then the coach will get fired, and some of the players will get arrested, then it starts all over again. I would rather read a magazine about golf--another sport that bores me to death. And really, is there anything more inane than the football talk show? How is it possible that anyone can tune in to a show dedicated to nothing more than utter speculation about who may do what in a football game? Does anyone really care about this?How about including the number of times players have been handcuffed? Now that might pique my interest! Longtime friends Jim and Terri drove down from Arlington to pal around with us last weekend, and we enjoyed their visit so much. 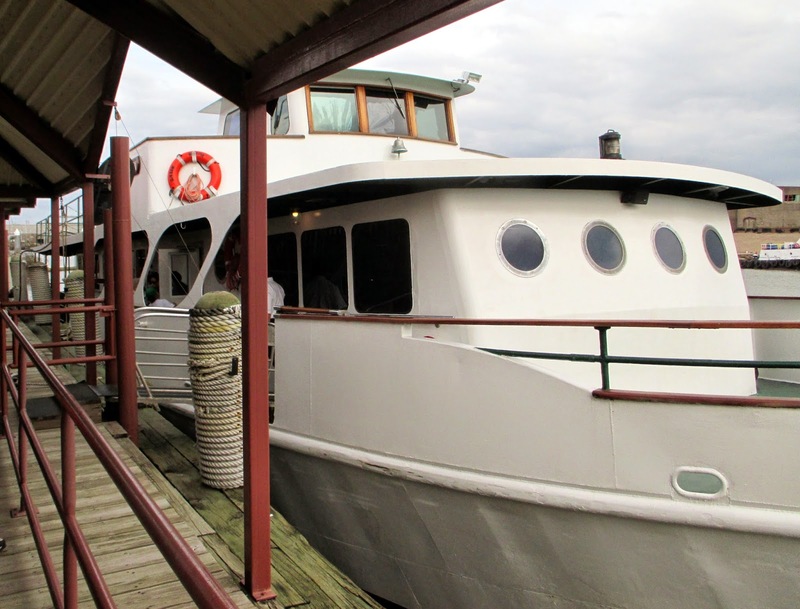 On the first evening, we ate at the Hong Kong Chinese Restaurant, a really good one, on Highway 2920 near Tomball and went on a boat tour of the Houston Ship Channel on Sunday afternoon. This free tour is sponsored by the Port of Houston authority and was well worth the hour or so that it took us to go from the turning basin past the I-610 bridge for seven miles down the channel. 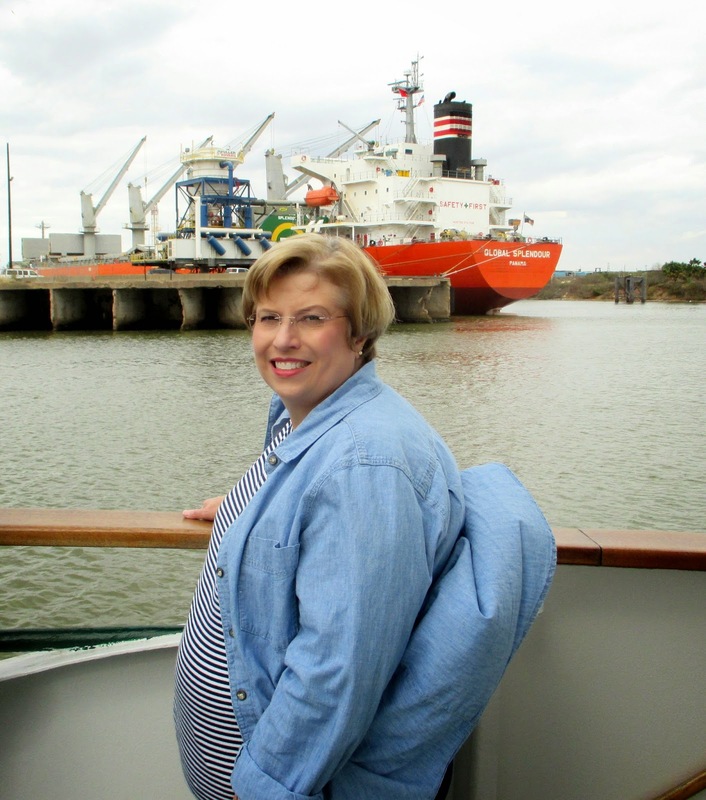 Although the narration was not always audible, we learned quite a bit about the Port of Houston that we didn't know, including its standing as second only to Rotterdam in the handling of petroleum product tonnage. The city fathers obviously had remarkable foresight back in 1912 when they were able to secure the funding for dredging Buffalo Bayou and creating the immense economic powerhouse that is the Port of Houston. Sandy Won't Like This Photo, Snapped as the Wind Caught her Shirttail. After the channel tour, we went to the Monument Inn in La Porte to have some seafood and continue watching the traffic on the ship channel. The food was great and the fellowship even better, so a great time was had by all.